Try a pick scrape from the bridge to the edge of the neck then continue the slide with a fretting hand finger (try to avoid pressing down too hard and sounding a note). You don't always have to slide towards the neck from the bridge. You could slide the other way or slide back and forth. It is even possible to scrape three strings at a time if you turn the pick so the longest edge runs across the strings. This creates an even more extreme sounding scrape. If you place your thumb against the string as you scrape, the thumb will sound notes as you slide down the neck. This can create a transition from a scrape to a regular slide as you go from the bridge to the neck. 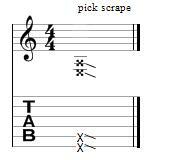 A pick scrape is notated by diagonal lines (like a slide) and can be accompanied by the mute symbol (x) or written instruction.